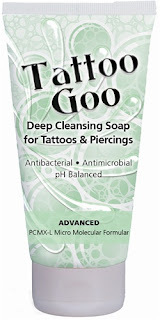 Tattoo Goo's Deep Cleansing Antibacterial Aftercare Soap for Tattoos & Piercings. Tattoo Goo's deep cleansing soap is formulated to provide a broad spectrum germicidal kill while being gentle to the skin. The soap's specially formulated cleansing agent PCMX-L cleans at a deeper level to prevent bacterial growth and infection by removing more dirt and dead skin cells. New healthy emerging layers of skin are exposed, an important step in tattoo healing and piercing aftercare. Item 401 - 2 oz bottle. When choosing a soap you want to pick one that is not harsh to the skin. Harsh soaps can dry out the skin causing "special safe harbors" for bacteria and viruses to hide in making it very difficult to get a good kill on the skin. Traditional antimicrobial / antibacterial soaps contain quats (quaternary ammonia) compounds which carry very alkaline (high pH's) although effective at short term kills they are ineffective on persistent antimicrobial activity and they complicate good skin hygiene by systematically destroying the acid mantle of the skin. Ordinary "green" soap you speak of is an example of this kind of activity. Most people don't realize that although alcohol is known as a Class 1 Antiseptic it has a VERY short kill time maybe only 10-15 seconds. If you read the medical articles which support the use of alcohol based products you will find that in order to gain an "effective kill" you need to use at least 5ml's on your hands. Most applications by individuals barely reach 1ml. These products are temporary and do not provide a sustainable germ resistant environment. Tattoo Goo Deep Cleansing Soap is formulated to provide a broad spectrum kill while at the same time being gentle on the skin. Unlike "green" soap this formula has a slightly acidic pH and contains a key ingredient which helps to buffer the skin while providing additional killing power. The key ingredient is PCMX-L a combination of Chloroxylenol (PCMX) and Sodium Lauryl Sarcosinate (Lauricidin). Lauricidin is a derived from palm seed extract. A unique and proprietary process provides a molecular structure capable of cleaning the skin at a deeper level. (This is achieved by reducing the molecular size to better clean the skin) This ingredient is non-toxic to human skin but highly efficient at disrupting pathogenic microbes at a cellular level. Once the cell wall is disrupted the bacterial cannot recombine or multiply and they die. PCMX is a well documented antimicrobial / antibacterial ingredient. By combining the 2 of these ingredients you get a fast acting, broad spectrum kill without damaging the skin. As a demonstration of the cleaning efficiency of this product have the client wash their hands thoroughly with the soap. You will notice 2 things. First the soap lathers very well providing a soft comfortable cleaning activity. When the hands are rinsed and still wet have them "squeak" their fingers together, you will have a distinct squeaky clean feeling on a tactile level. Because the product cleans a deeper level more dirt and dead cells are removed exposing the clean emerging layer of skin. The soap is also engineered to provide a sheeting action when rinsed much like a rinsing agent in a dishwasher. As a comparison to over the counter brands antibacterial soaps Tattoo Goo Deep Cleansing Soap like contains a broader kill spectrum and a deeper cleaning action. Many cheaper soaps leave residue on the skin, these chemical residues contribute to skin problems as they prevent the skin from breathing properly leading to dried out skin.